Bloom by Kevin Panetta. January 29, 2019. First Second, 368 p. ISBN: 9781250196910. Int Lvl: YA; Rdg Lvl: YA. 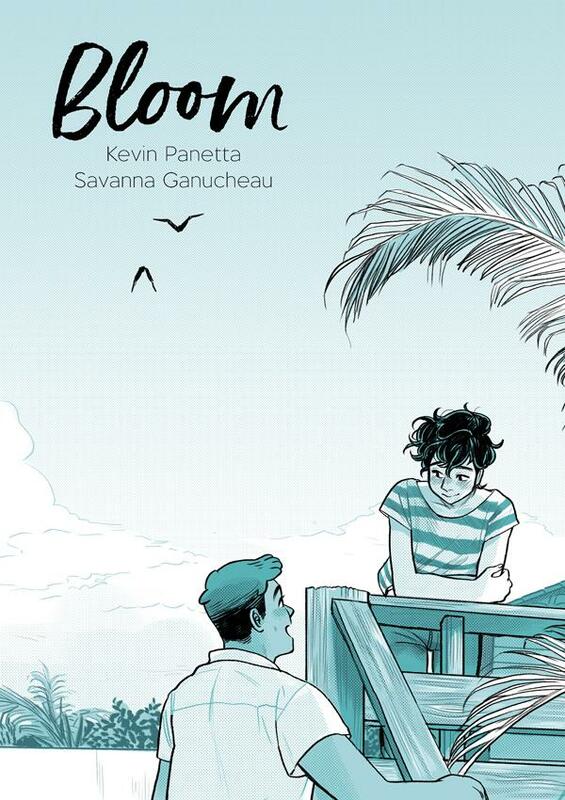 Writer Kevin Panetta and artist Savanna Ganucheau concoct a delicious recipe of intricately illustrated baking scenes and blushing young love, in which the choices we make can have terrible consequences, but the people who love us can help us grow. Grades 9-12. Ari is sick of working at his dad’s bakery, and he can’t wait to get out of his dead-end beach town and move to the city with his band. He knows his dad will need help, though, so he tries to at least find a replacement before he leaves forever. Enter Hector, the adorable cooking-school dropout who’s in town cleaning out his late grandma’s house and is absolutely perfect for the job. Over baking, deliveries, and languorous summer fun, Hector and Ari get closer, and Ganucheau’s perfectly languid artwork, rendered in arcing brushstrokes and a minimal palette, beautifully showcases the quiet, everyday moments that draw them together. Her montages of baking are particularly lovely—the panel edges in these scenes transform into soft, organic shapes accented with sentimental flourishes—and it’s clear that she’s paid careful attention to the motions and techniques of making bread and cakes. When disaster strikes and the future of the bakery is called into question, Ari has to face some hard truths about himself. A quiet, earnest romance with warmth and depth. Kevin Panetta is a comic book writer. He has worked on books for properties like Steven Universe, Regular Show, Bravest Warriors, and WWE. 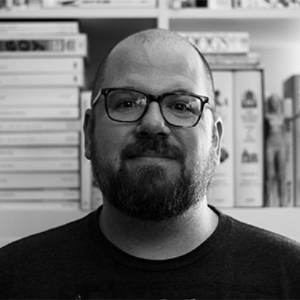 Kevin came to writing after years dedicated to comics as a reader, retailer, and convention organizer. He lives in Washington, DC, with his cool wife and two cool dogs. Savanna Ganucheau is a comic artist living in Australia, with a BFA in film from the University of New Orleans. 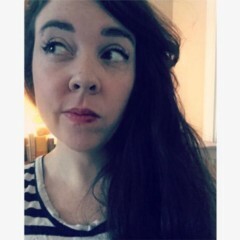 In addition to creating the popular webcomic George and Johnny, Savanna’s artwork has appeared in notable publications including Jem and the Holograms, Adventure Time Comics, and Lumberjanes. 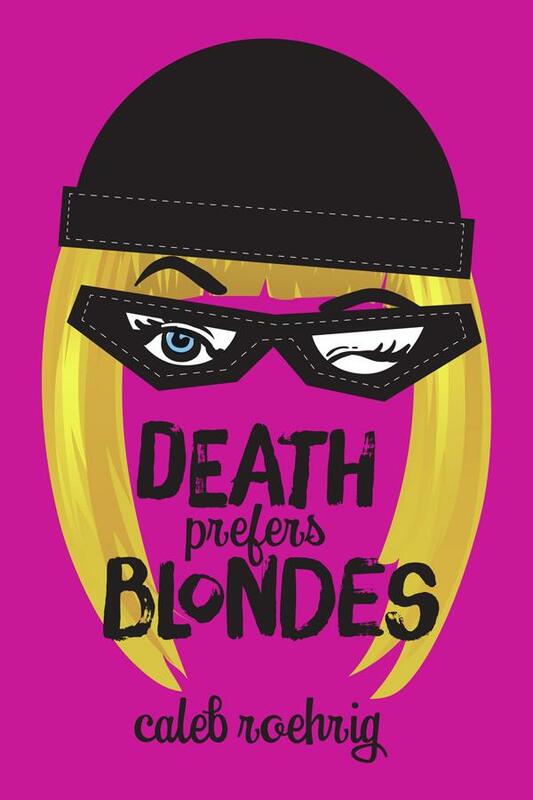 Death Prefers Blondes by Caleb Roehrig. January 29, 2019. Fiewel & Friends, 448 p. ISBN: 9781250155825. Int Lvl: YA; Rdg Lvl: YA. But then Margo’s personal life takes a sudden, dark turn, and a job to end all jobs lands her crew in deadly peril. Overnight, everything she’s ever counted on is put at risk. Backs against the wall, the resourceful thieves must draw on their special skills to survive. But can one rebel heiress and four kickboxing drag queens withstand the slings and arrows of truly outrageous fortune? Or will a mounting sea of troubles end them―for good? Grades 10-12. Margo Manning: socialite, heiress . . . art thief? By day, she avoids the paparazzi, who have dubbed her Mad Margo. At night, she dons a platinum wig and commits heists with a group of drag queens. Margo, a consummate planner, eliminates any variables that may get them caught. Still, it’s a dangerous game they’re playing, and while Margo may not need the money, her friends do: Leif strains to pay the pricey tuition at his dance academy so he doesn’t have to return home to his deeply religious parents; mechanic Davon, essentially orphaned, makes ends meet by working at a drag club with his found family; and Margo’s best friend, Axel, and his younger brother, Joaquin, struggle to support their sick mother after their father is arrested for embezzlement. When the heist of a lifetime comes their way, the crew find themselves with difficult choices to make. At the same time, Margo is surrounded by upheaval in her father’s company, and she’ll need all her wiliness to navigate her way out. Roehrig (Last Seen Leaving​, 2016) takes a sharp dive out of thriller territory with this high-stakes adventure. Balancing Oceans 11–level heists, corporate espionage, and gender and sexual identity politics isn’t easy, but Roehrig manages it with aplomb, skillfully threading in Hamlet references to boot. Clever, thrilling, and a wildly good time. In this action-packed thriller, heiress and party girl “Mad Margo” Manning seems to have it all-clothes, parties, fast cars, and loyal friends. What she doesn’t have is the attention of her father, Harland, who spends time between running his businesses and dealing with a mysterious ailment. Margo attempts to rectify this by organizing heists to steal goods for hire with a team of her best friends, all in drag (code names include Liesl Von Tramp and Dior Galore). She knows how irate Harland would be if she ever got caught. When Harland suddenly dies from mysterious ailments, Margo takes it upon herself to figure out what happened. Using her skills as an art and jewel thief, as well as the expensive, state-of-the-art equipment that only an heiress can afford, Margo and her crew follow the evidence to catch a killer. With a knack for infusing tongue-in-cheek humor into darker subject matters, Roehrig (White Rabbit) effectively creates a likable thief whose actions seem justifiable. Margo’s crew is equally likable, each contending with their own issues, making them relatable despite their less-than-legal hobby. With a nod to Hamlet, Roehrig’s five-act structure keeps the dramatic tension high with cinematic break-in sequences that render this tale ripe for adaptation. Ages 13-up. Caleb Roehrig is a writer and television producer originally from Ann Arbor, Michigan. Having also lived in Chicago, Los Angeles, and Helsinki, Finland, he has a chronic case of wanderlust, and can recommend the best sights to see on a shoestring budget in over thirty countries. A former actor, Roehrig has experience on both sides of the camera, with a résumé that includes appearances on film and TV—as well as seven years in the stranger-than-fiction salt mines of reality television. In the name of earning a paycheck, he has: hung around a frozen cornfield in his underwear, partied with an actual rock-star, chatted with a scandal-plagued politician, and been menaced by a disgruntled ostrich. 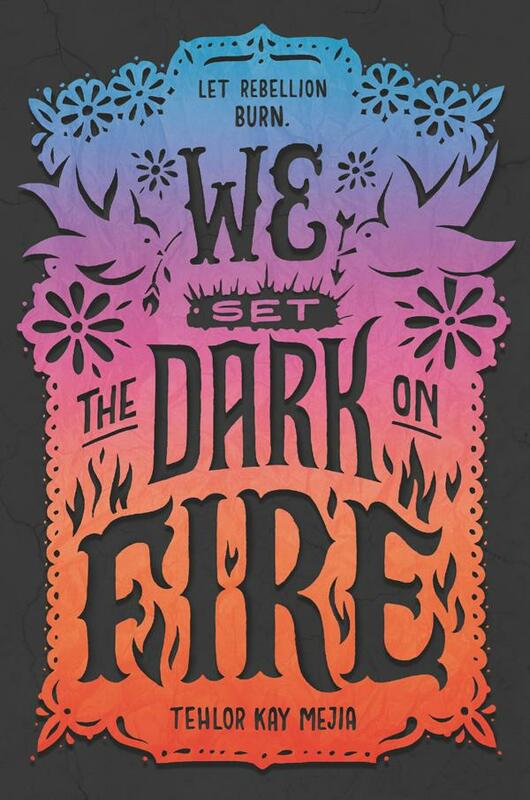 We Set the Dark on Fire by Tehlor Kay Mejia. February 26, 2019. Katherine Tegen Books, 384 p. ISBN: 9780062691316. Int Lvl: YA; Rdg Lvl: YA. In this daring and romantic fantasy debut perfect for fans of The Handmaid’s Tale and Latinx authors Zoraida Córdova and Anna-Marie McLemore, society wife-in-training Dani has a great awakening after being recruited by rebel spies and falling for her biggest rival. At the Medio School for Girls, distinguished young women are trained for one of two roles in their polarized society. Depending on her specialization, a graduate will one day run a husband’s household or raise his children. Both paths promise a life of comfort and luxury, far from the frequent political uprisings of the lower class. Will Dani cling to the privilege her parents fought to win for her, or will she give up everything she’s strived for in pursuit of a free Medio—and a chance at a forbidden love? Grades 9-12. In Medio, a myth tells of the Sun God, who took two wives, one wise and loyal, the other sensual and nurturing. Now, selected young women train to become the dual wives of the nation’s politicians: the Primera to be his partner in work and business, and the Segunda to run his home and family. Daniela’s poor parents lied to get her into the school, hoping to secure her a better future, and indeed, Dani has become the top Primera student, keeping her emotions in check and her forged papers a secret. Mateo, her new husband, seems strangely cold and cruel, and it doesn’t help that the family has chosen Dani’s longtime rival, Carmen, as their Segunda. But the worst comes when Dani is contacted by a resistance group and asked to spy on Mateo and politicos like him. As she learns more about Mateo’s narrow-mindedness and oppressive politics—​and as she and Carmen grow startlingly closer—Dani’s sympathy for the resistance grows, but is there even a life for her beyond this one? Like the revolution, Mejia’s world is carefully built. With its achingly slow-burn romance and incisive examination of power structures, this is a masterfully constructed novel, made all the more impressive as it’s a debut. This timely examination of how women move through the world is potent and precise, and readers will be eager for the sequel. 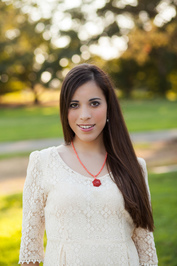 Tehlor Kay Mejia is a YA author and poet at home in the wild woods and alpine meadows of Southern Oregon. When she’s not writing, you can find her plucking at her guitar, stealing rosemary sprigs from overgrown gardens, or trying to make the perfect vegan tamale. She is active in the Latinx lit community, and passionate about representation for marginalized teens in media. The Love and Lies of Rukhsana Ali by Sabina Khan. January 29, 2019. Scholastic Press, 336 p. ISBN: 9781338227017. Int Lvl: YA; Rdg Lvl: YA. Seventeen-year-old Rukhsana Ali has always been fascinated by the universe around her and the laws of physics that keep everything in order. But her life at home isn’t so absolute. Unable to come out to her conservative Muslim parents, she keeps that part of her identity hidden. And that means keeping her girlfriend, Ariana, a secret from them too. Luckily, only a few more months stand between her carefully monitored life at home and a fresh start at Caltech in the fall. But when Rukhsana’s mom catches her and Ariana together, her future begins to collapse around her. Devastated and confused, Rukhsana’s parents whisk her off to stay with their extended family in Bangladesh where, along with the loving arms of her grandmother and cousins, she is met with a world of arranged marriages, religious tradition, and intolerance. Fortunately, Rukhsana finds allies along the way and, through reading her grandmother’s old diary, finds the courage to take control of her future and fight for her love. 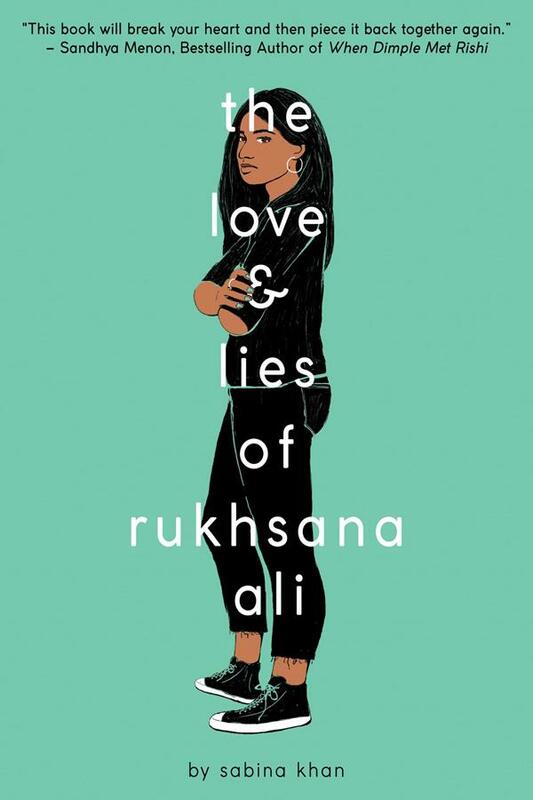 A gritty novel that doesn’t shy away from the darkest corners of ourselves, The Love and Lies of Rukhsana Ali provides a timely and achingly honest portrait of what it’s like to grow up feeling unwelcome in your own culture and proves that love, above all else, has the power to change the world. Grades 9-12. Rukhsana Ali chafes against her conservative Muslim parents and their hopes for her future. The 17-year-old has her own plans, like going to Caltech for engineering and openly being with her girlfriend, Ariana. But when her parents ultimately find out about Ariana, they’re quick to send Rukhsana to Bangladesh to be married. Can she balance fighting for the life she wants for herself without devastating her family? Khan’s moving novel brings humanity and nuance to the topics of arranged marriage and familial obligations, and her characters are beautifully fleshed out. Rukhsana’s genuine love and respect for her family and culture amplify the stakes of her choice to determine her own path, and Khan’s account of Bangladeshi traditions, food, and various aunties to dodge rings true. While some characters might initially seem very black-and-white, as Khan gradually peels away the layers of their backstories, they become more fully formed. This moving novel offers readers a deep look into Bengali traditions and dreams for a more inclusive future, with a resilient girl at the heart of it all. Like many American teenagers straddling two cultures-that of their foreign-born parents and that outside their home-Seattle high school senior Rukhsana has hopes that diverge from her family’s. Though her conservative Bengali-Muslim parents expect her to attend the nearby University of Washington and to marry a young man, she has secretly applied to Caltech in Pasadena, Calif., and is a closeted-to-them lesbian. Her parents eventually give in on Caltech, but when they discover her kissing her girlfriend, Ariana, they furiously spirit Rukhsana away to Bangladesh under false pretenses. Khan skillfully depicts Rukhsana’s mix of emotions toward her family-frustration and anger, love and loyalty-as well as resentment at the differing expectations her parents hold for her and for her carefree younger brother, Aamir. Relationships ring true, including the siblings’ teasingly affectionate relationship and Rukhsana and Ariana’s struggles navigating their romance under difficult circumstances. The complicated plot and the large cast of characters, both in Seattle and in Bangladesh, occasionally overwhelm, but Rukhsana’s voice offers a steady blend of compassion and humor as she schemes-with several likable allies-to follow her dreams, perhaps at the cost of losing her family. Ages 14-up. 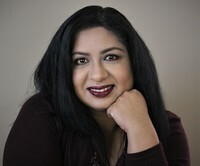 Sabina Khan is an educational consultant and a karaoke enthusiast. After living in Germany, Bangladesh, Macao, Illinois and Texas, she has finally settled down in beautiful British Columbia, Canada, with her husband and three daughters, one of whom is a fur baby. She writes about Muslim teens who are straddling cultures. 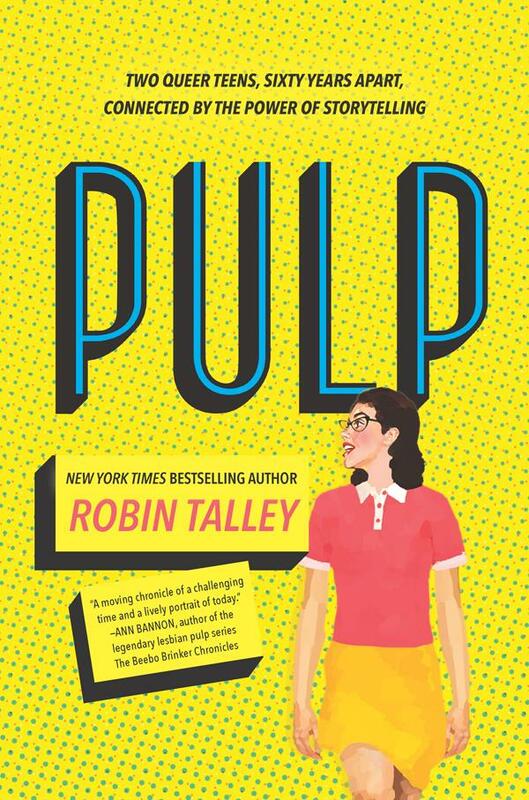 Pulp by Robin Talley. November 13, 2018. Harlequin Teen, 416 p. ISBN: 9781335012906. Int Lvl: YA; Rdg Lvl: YA. Grades 9-12. Not many YA novels contain one lesbian romance, let alone four, but Talley’s newest pulls it off, while creatively spanning time and genre. In the present day, Abby Zimet is out and proud, despite chaffing against the “just friends” label newly instituted by her ex. Breakup stress is compounded by her parents’ crumbling marriage, and Abby finds escape in an unlikely place: vintage lesbian pulp fiction. So much so that researching the genre and writing her own pulp novel becomes her senior project. The book that starts her obsession is Women of the Twilight Realm, by Marian Love, passages of which intercut Abby’s narrative, along with 18-year-old Janet Jones’ story line, set in 1955. Janet’s own discovery of lesbian lit holds many parallels to Abby’s, but her closeted life offers a dramatic contrast. Talley pulls pre-Stonewall history, such as the lavender scare, the gay bar scene, and actual lesbian pulp authors, into this fun but substantive read. As Abby loses herself to her project, she eventually finds firmer footing in her own life and identity. Robin lives in Washington, D.C., with her wife, their baby daughter, an antisocial cat and a goofy hound dog. Whenever the baby’s sleeping, she’s probably busy writing young adult fiction about queer characters, reading books, and having in-depth conversations with friends and family about things like whether Jasmine’s character motivation was sufficiently established in Aladdin. 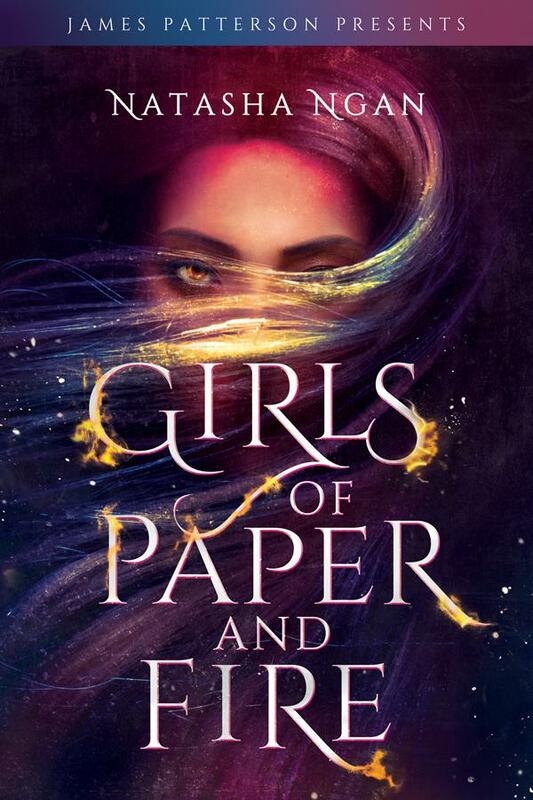 GIrls of Paper and Fire by Natasha Ngan. November 6, 2018. Jimmy Patterson Books, 400 p. ISBN: 9780316561365. Int Lvl: YA; Rdg Lvl: YA. Grades 10-12. In Ikhara, there are three castes: the chimera-like, demonic Moon; the part-human, part-demon Steel; and the fully human Paper. Paper Lei’s otherworldly golden eyes draw unwanted attention, and when she is picked to become a Paper Girl—a member of the Demon King’s human harem—she cannot say no. Lei trains with other Paper Girls, learning exactly how few freedoms she is allowed, and dreading the day the king summons her. As she navigates this new world of social graces and subterfuge, she grows close to Wren, a Paper Girl with a mysterious past. Loving a fellow Paper Girl is dangerous enough, but Wren is involved with deadlier plots, and Lei learns just how far she’s willing to follow her heart. This glittering commercial romance has real stakes, and the lavish, intriguingly conceptualized world will capture readers. This is a story about violence against women and difficult choices, and it’s rarely easy to read. Love stories between women are still disappointingly few in fantasy, and romance and action fans alike will find much to savor here. Natasha Ngan is a writer and yoga teacher. She grew up between Malaysia, where the Chinese side of her family is from, and the UK. This multicultural upbringing continues to influence her writing, and she is passionate about bringing diverse stories to teens. 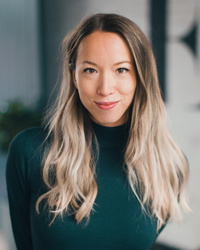 Natasha studied Geography at the University of Cambridge before working as a social media consultant and fashion blogger. She recently moved to Paris, where she likes to imagine she drifts stylishly from brasserie to brasserie, notepad in one hand, wineglass in the other. In reality, she spends most of her time getting lost on the metro and confusing locals with her French. 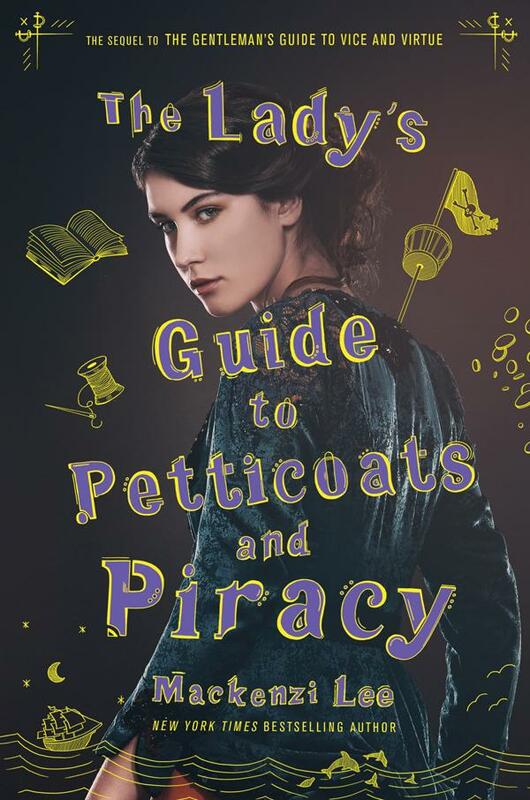 The Lady’s Guide to Petticoats and Piracy by Mackenzi Lee. October 2, 2018. Katherine Tegen Books, 450 p. ISBN: 9780062795328. Int Lvl: YA; Rdg Lvl: YA. In this highly anticipated sequel to the New York Times bestselling The Gentleman’s Guide to Vice and Virtue, Felicity Montague must use all her womanly wits and wiles to achieve her dreams of becoming a doctor—even if she has to scheme her way across Europe to do it. A must-have for fans of Mackenzi Lee’s extraordinary and Stonewall Honor-winning novel. Grades 9-12. Though her elder brother Monty may be content, cuddled up in the dregs of London with the boy of his dreams (The Gentleman’s Guide to Vice and Virtue, 2017), Felicity Montague has grander ambitions. Unfortunately, it’s the eighteenth century, and ambition in a woman isn’t well received. Felicity, who is determined to become a physician, has been met with resounding rejection from the hospitals of Edinburgh, though she has received a proposal that she won’t be accepting. Then she learns her medical idol may need an assistant, and he’s more forward-thinking than most—but he’s about to marry Johanna Hoffman, Felicity’s childhood best friend turned nemesis. Still, Felicity never said no to a challenge before, and so begins an adventure featuring field surgery, pirates, sea dragons, and one truly massive dog. Felicity, comfortable discussing medical science and not much else, and who ultimately realizes that she’s not interested in romantic or sexual relationships of any kind, is a singular heroine; Lee navigates her narration with even more aplomb than she did Monty’s. Felicity’s reconnection with Johanna and her gradual awareness of her own dismissiveness toward traditionally feminine interests adds wonderful depth, and Sim, the Muslim pirate inspired by pirate queens through history, offers a different image of strength and a window into a wider world. Lee’s research is thorough and organically incorporated, and this action-driven adventure is a joy. Mackenzi Lee holds a BA in history and an MFA in writing for children and young adults from Simmons College. 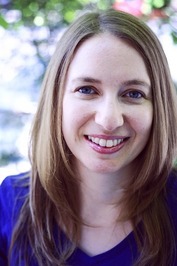 She is the New York Times bestselling author of the historical fantasy novels This Monstrous Thing and The Gentleman’s Guide to Vice and Virtue (HarperCollins), as well as the forthcoming The Lady’s Guide to Petticoats and Piracy (coming in 2018 from HarperCollins) and Semper Augustus (coming in 2019 from Flatiron/Macmillan). She is also the author of Bygone Badass Broads (Abrams, 2018), a collection of short biographies of amazing women from history you probably don’t know about but definitely should, based on her popular twitter series of the same name. She currently calls Boston home, where she manages an independent bookstore, drinks too much Diet Coke, and pets every dog she meets. 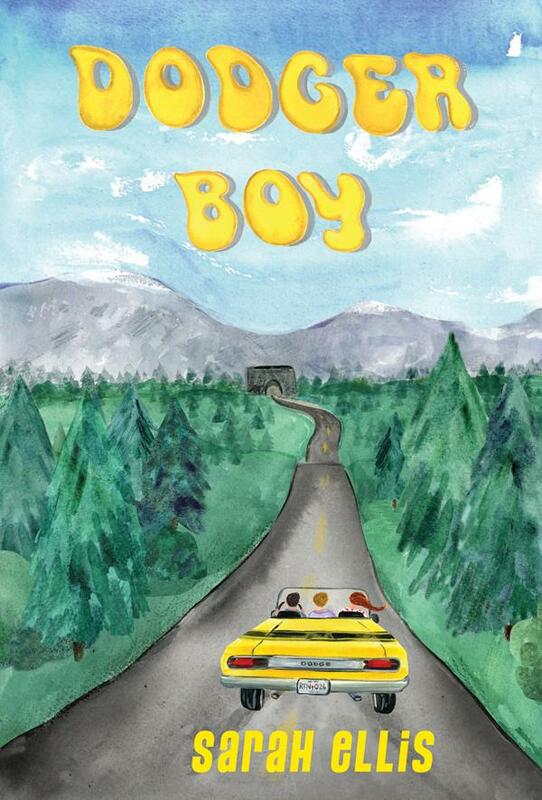 Dodger Boy by Sarah Ellis. September 1, 2018. Groundwood Books, 176 p. ISBN: 9781773060729. Int Lvl: 5-8; Rdg Lvl: 5.2; Lexile:. In 1970 Vancouver, thirteen-year-old Charlotte and her best friend, Dawn, are keen to avoid the pitfalls of adolescence. Couldn’t they just skip teenhood altogether, along with its annoying behaviors – showing off just because you have a boyfriend, obsessing about marriage and a ring and matching dining-room furniture? Couldn’t one just learn about life from Jane Austen and spend the days eating breakfast at noon, watching “People in Conflict,” and thrift-store shopping for cool castoffs to tie-dye for the upcoming outdoor hippie music festival? But life becomes more complicated when the girls meet a Texan draft dodger who comes to live with Charlotte’s Quaker family. Tom Ed expands Charlotte’s horizons as they discuss everything from war to civil disobedience to women’s liberation. Grappling with exhilarating and disturbing new ideas, faced with a censorship challenge to her beloved English teacher and trying to decode the charismatic draft dodger himself, Charlotte finds it harder and harder to stick to her unteen philosophy, and to see eye to eye with Dawn. Grades 5-8. As far as 13-year-old Charlotte is concerned, one of the best things about her longtime friendship with Dawn is their Unteen Pact, an agreement to skip the “bizarre behavior of boy-crazy girls acting fake-stupid.” But when 19-year-old Tom Ed, a draft dodger from Texas, comes to stay for a while with Charlotte’s Quaker family in Vancouver, B.C., Dawn develops a crush on him. And after he abruptly leaves the city, she rashly follows him without telling anyone. In a subplot, Charlotte gathers her courage to challenge a book-banning attempt at school without Dawn’s support. Meanwhile, she struggles with the knowledge that someone close to her is gay. Well-drawn individual characters and their relationships are at the heart of the story. Writing in third person from Charlotte’s point of view, Ellis realistically depicts the stresses on the girls’ increasingly ragged friendship, from disappointments, petty annoyances, and painful barbs to larger issues of trust and loyalty. An appended note fills in basic information about draft-eligible immigrants from the U.S. to Canada during the Vietnam War. An involving Canadian novel. 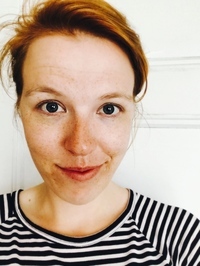 Writer, columnist, and librarian Sarah Ellis has become one of the best-known authors for young adults in her native Canada with titles such as The Baby Project, Pick-Up Sticks, and Back of Beyond: Stories of the Supernatural. 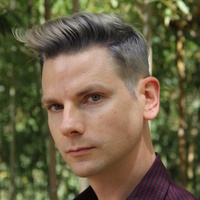 In addition to young adult novels, Ellis has also written for younger children and has authored several books about the craft of writing. 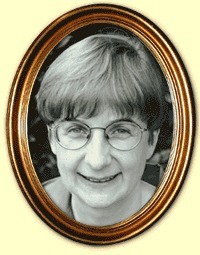 Ellis was born in Vancouver, British Columbia, Canada, in 1952, the youngest of three children in her family. As she once noted, “[My] joy in embroidering the truth probably comes from my own childhood. My father was a rich mine of anecdotes and jokes. He knew more variations on the ‘once there were three men in a rowboat’ joke than anyone I’ve encountered since. Blanca and Roja by Anna-Marie McLemore. October 9, 2018. Fiewel + Friends. 375 p. ISBN: 9781250162717. Int Lvl: YA; Rdg Lvl: YA; Lexile: 760. Grades 9-12. 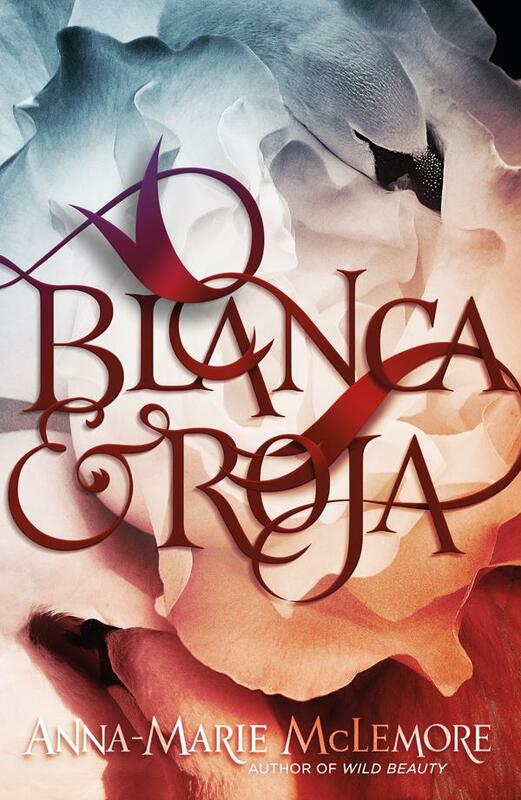 Sisters Blanca and Roja del Cisne have grown up understanding their family’s curse. Long ago, their ancestor bargained with the swans for a daughter. Every generation, the Del Cisnes have two daughters, but eventually, the swans always take one back. Roja, fierce and willful, has always believed she’d be the sister turned into a swan, while graceful, compliant Blanca would remain a girl. But if there’s anything Blanca is willing to fight for, it’s her sister. As their days together wane, two boys with curses of their own enter their lives. 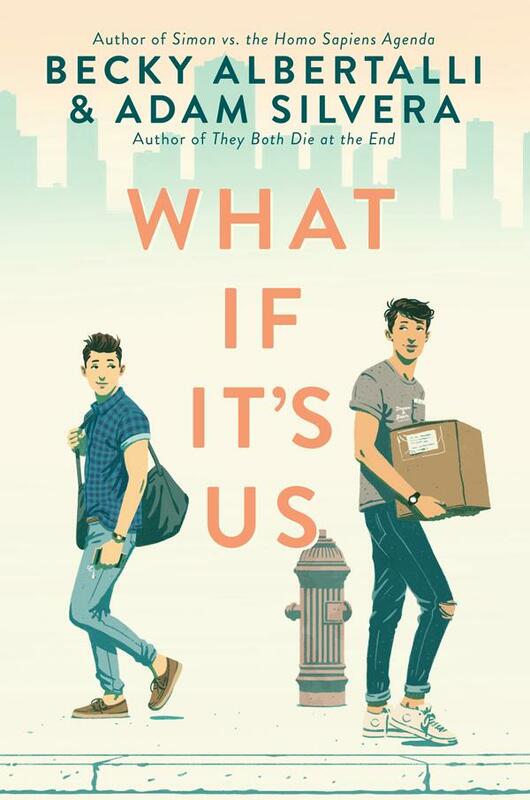 Barclay Holt, once the son of a wealthy, treacherous family, who has been trapped for a year in the body of a bear; and his best friend, Page Ashby, child of apple farmers, who identifies as a boy but finds that the pronouns she and her fit comfortably as well. As the four come closer together, their fates may become unalterably linked. In her fourth novel, McLemore (Wild Beauty​, 2017) is at her finest; she twines Latino folklore through the fairy tales of Swan Lake and Snow White &amp; Rose Red to create a story that is wholly original. She writes openheartedly about families found and families given, the weight of expectation and the price of duty, and in the end offers up something that’s vibrant, wondrously strange, and filled to the brim with love of all kinds. Anna-Marie McLemore was born in the foothills of the San Gabriel Mountains, raised in the same town as the world’s largest wisteria vine, and taught by her family to hear la llorona in the Santa Ana winds. 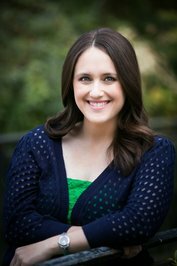 Her debut novel The Weight of Feathers was a Junior Library Guild Selection, a YALSA Best Fiction for Young Adults book, and a finalist for the William C. Morris Debut Award.